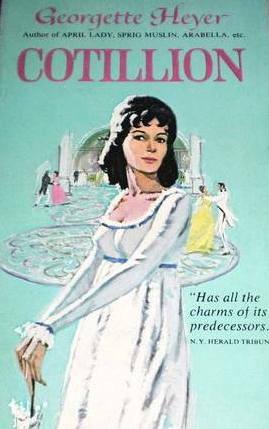 This entry was posted in Regency, Uncategorized and tagged Anne Elliott, Cotillion, Frederick Standen, Georgette Heyer, Jane Austen, Kitty Charing, Persuasion, Regency literature by Angelyn. Bookmark the permalink. “What you read during the Regency was generally held to be informative of your character.” Might that be the case today? Romance readers? I don’t know that people place such importance on what someone is reading today as they did then. The proliferation of other media may have something to do with that. Loved that book!! Great post, Angelyn. Tweeted. Cotillion is one of my favorites. Thanks, Ella! Love reading books about the Regency period! Great post, Angelyn! I’m glad you enjoyed the post, Lana. Thoroughly enjoyable post, always glad to find someone else who enjoys the delights of Georgette Heyer, one of my favourite authors :). Freddy is perfect, I especially love when Kitty describes a knight in shining armour as rather impractical, in comparison to Freddy who proves indispensable in moments of a social crisis! I wish I could meet Freddy. He’s one of my favorite heroes–and Heyer is one of my favorite authors. She’s subtle and very clever. Thanks for stopping by! I had forgotten the egotistical Mr. Elliott in Persuasion only read the Baronetage. Is that not masterful? Absolutely, Cheryl. A father who is obsessed with himself and his rank misses out on one of the most beautiful stories of the Regency–his daughter’s.